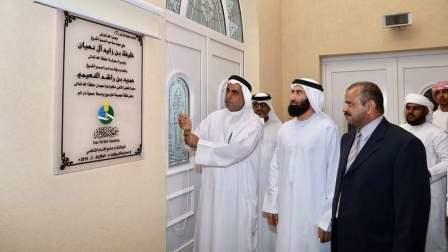 A new mosque was inaugurated at Al Bustan area in Ajman on Saturday with a capacity to accommodate up to 1,000 worshippers. Al Shafie Mosque, which was built at a cost of Dh4.7 million, has an area of 1,457 sqm, according to a senior official at the Dar Al Ber Society. Abdullah Ali bin Zayed Al Falasi, executive director of Dar Al Ber, said the new mosque, donated by philanthropists nationwide, proudly reflects people and officials' trust in the Dar Al Ber Society. "The Dar Al Ber Society has built seven mosques across the country in five years, while five others are under construction. They will be opened later this year. These include three new mosques to be opened before Ramadan, increasing the number of the mosques to be inaugurated by the society in the 'Year of Zayed' to six." Al Falasi pointed out that Dar Al Bar has built thousands of mosques in more than 36 countries around the world. "These are on three continents; Asia, Africa, and Europe." The new mosque includes a main hall for performing prayers, he explained. "It also comprises an open courtyard, an ablution area, several toilets, two houses for the Imam and Muezzin." Ashraf Faris, A Jordanian resident of Al Bustan area, said the new mosque is a great addition to the heavily populated area. "Praying outside the mosque will become history with the new spacious 'House of God'," he said, paying tributes to the authorities concerned for attending to people's concerns. "To donate for building a mosque is highly rewarded by Almighty Allah, and is one of the reasons for entering paradise in the hereafter," said Samir Jassim, a Syrian resident.